Christopher has quickly established a busy practice in civil insurance fraud. He acts for a number of major defendant insurers in relation to suspicious or fraudulent claims arising from road traffic accidents. 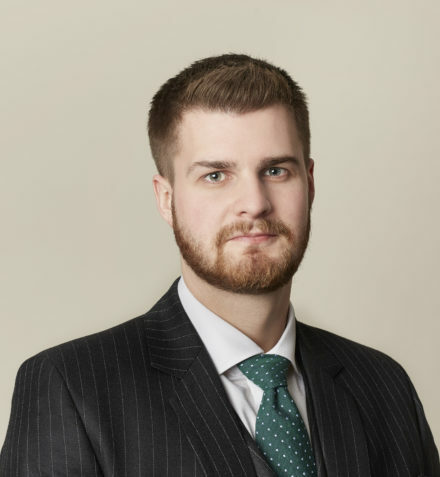 Christopher has extensive experience of cases involving staged accidents, ‘stooge’ vehicles, low-speed impact (LSI), phantom passengers, exaggerated credit hire and exaggerated personal injury claims that require consideration of Section 57 Criminal Justice and Courts Act 2015. Christopher has experience of multi-track and fast-track trials, as well as interim applications, costs and case management conferences and costs-only proceedings. Christopher routinely drafts pleadings on behalf of a number of major insurers. He is content to positively allege fraud where necessary, as well as providing robust defences in respect of suspicious claims. Christopher is happy to provide pre-action advice on the merits of individual cases. Christopher is happy to work to short deadlines where papers need to be turned around quickly. Christopher has developed a particular interest in claims involving credit hire. As an area of law which continues to develop in the Court of Appeal and Supreme Court, Christopher is always alive to recent developments. He regularly publishes articles and provides bespoke training on this topic. Christopher is particularly familiar with the legal arguments surrounding the enforceability of credit hire agreements. Despite the implications of the recent decision in Irving v Morgan Sindall PLC  EWHC 1147 (QB), Christopher is frequently successful in arguing that hire agreements are unenforceable on the basis of fraudulent misrepresentation. Christopher Boxall has a wide-ranging personal injury practice and acts on behalf of both Claimants and Defendants, including claims funded by a CFA. Christopher has extensive experience dealing with claims arising from road traffic accidents, EL/PL claims (including Highways Act claims) and criminal injury compensation (CICA) claims. Christopher also accepts instructions to draft pleadings and advices on quantum and/or liability. He is happy to work to short deadlines where papers need to be turned around quickly. Christopher is particularly familiar with the legal arguments surrounding the enforceability of credit hire agreements and the implications of the recent decision in Irving v Morgan Sindall PLC  EWHC 1147 (QB). Christopher regularly deals with fraudulent claims on the Fast Track. He is also happy to advise at the pre-issue stage and draft pleadings. Christopher is known for his meticulous approach when examining medical records, leaving no stone unturned. Christopher has acted previously for Thomas Cook. Christopher Boxall is a Grade 1 prosecutor. He successfully completed a common law pupillage under the supervision of Kama Melly QC. Christopher regularly appears in the Crown and Magistrates courts for both the prosecution and the defence. He deals with a wide range of offences, including serious sexual and violent offences, and has experience conducting trials subject to the section 28 procedure. Christopher is particularly experienced in dealing with offences under the Road Traffic Act, particularly in respect of accidents that have caused significant injury to those involved. Christopher is also regularly instructed to raise exceptional hardship and special reasons arguments on behalf of Defendants. Christopher has particular experience dealing with cases involving vulnerable and intimidated witnesses. He is known for his concise approach when dealing with witnesses and clients, being able to narrow issues whilst ensuring that parties have a clear understanding of the proceedings in which they are involved. R v J – (2017) Leeds Crown Court. Successful defence of a man charged with sexual activity with a 14-year old child whilst on a family holiday in Fuerteventura. The prosecution alleged the Defendant had entered a bedroom unsupervised and sexually assaulted a 14 -year old complainant, in the presence of three other children who all gave evidence against the Defendant under the Section 28 procedure. The Defendant was acquitted after a five-day trial. Christopher also accepts instructions to draft pleadings and advices on quantum and/or liability. He is happy to work to short deadlines where papers need to be turned around quickly. Christopher successfully completed his pupillage under the supervision of Andrew Wilson and Kama Melly QC. Christopher Boxall accepts instructions to represent clients in disputes involving Constructive Dismissal, Redundancy, Discrimination and Breach of Contract. Christopher has previously dealt with cases to conclusion in the Employment Tribunal and is keen to develop his practice in this area.